Warning – no food pictures at all! One piece of meat on your plate at a time doesn’t lend itself to photography! Last time I was in Leeds (back in 2012) my mate, Jenny, and I had the idea that we would head to Fazenda. I’d heard some good things about it and as Jenny loves meat (veggies not so much) it seemed like a really good option for us. Unfortunately, on that occasion we left booking until 2pm on the Saturday that we wanted to go … You can imagine how THAT ended! This time round we were a lot more organised. Jenny booked well in advance for our 5:30pm sitting (the idea was to take the small eating machine with us), we were assured we had a lovely table … and then a dose of reality kicked in and I realised that there was no way the jet lagged small child was going to stay awake (and peaceable) for even the earliest of dinners. This meant that Jenny and I were dining solo and insanely early. 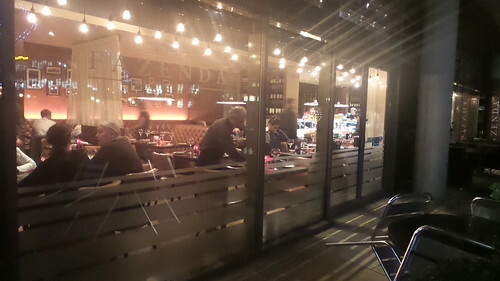 However, because Fazenda is in Granary Wharf it means that there is a reasonable post work trade so even early sitters like me won’t feel like they are rattling around an empty restaurant. 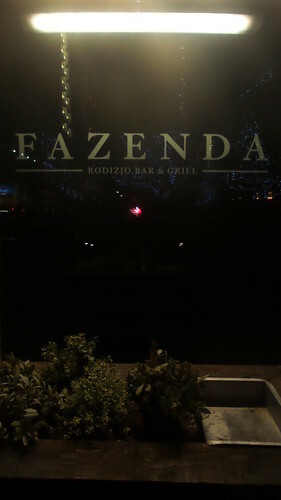 Fazenda is a rodizio, which is a Brazilian all you can eat steakhouse. This means you sit at your table and flip a coloured card (red or green) to indicate whether or not you want more food. The waiters bring around giant skewers with different meats on them and if you fancy some, they slice off a couple of pieces and you eat this, before waiting for the next offering. At our mid-week dinner, it was #27.30 a head (before drinks, coffees, desserts) so you do have to head along prepared to splash some cash. A Friday or Saturday night will set you back the best part of £30 but lunch times (with a cut down selection of meats, but the same all you can eat idea) come in at under £20. Prior to the meat coming around you can tuck into the very extensive salad bar. I can’t speak from first hand experience but it didn’t strike me as being particularly Brazilian – with everything from green salad through to smoked salmon and dolmades! Of course, it’s always important to make sure you leave space for the meats. By and large I thought the meat selection was pretty good and well cooked. If you like your meat really well done then you might struggle because a lot of the cuts of beef were very pink. Of course, there are also some chicken and even fish options and there is a vegetarian menu too (though, to be honest, I’d limit myself to taking hungry meat eaters to Fazenda …). I was a bit disappointed by the morcela (black pudding). On the night we were there it didn’t seem to be brought around routinely and I had to ask for it. I found it a little mealy with not enough spice (again – I can’t claim to be an expert on Brazilian black pudding – I just like mine to have more texture). The wine list features a lot of South American wines – a good thing although I did feel that when it came to the sparkling wine, regionality had trumped quality. Jenn and I both had a glass of the Miolo Brazilian bubbles and neither of us rated it particularly highly. By the bottle, however, the list is interesting and features wines across price points. By the time we’d stuffed ourselves on all the meat there was no space left for desserts. Even so, the bill ended up topping the £75 mark which is quite expensive for a mid week low alcohol meal. Fazenda bills itself as a unique dining experience – and that it definitely is. A huge part of the meal is the theatre of choosing your cuts of meat and eating at a slow pace. You feel like you’re picking at snack size morsels but you get full quickly. I never feel as though I get value for money food wise at any kind of all-you-can-eat and Fazenda was no different – but big eating friends of mine have loved it! Was it the best steak I’ve ever eaten? No. In Leeds that honour went to the now defunct River Plate. But for entertainment value, in an area of the city with plenty of good bars for pre/post meal drinks, Fazenda definitely has its place.